This workshop focuses the sensor technology for interactive music performance with some viewpoints. At first, I will introduce and demonstrate many types of sensors as interfaces between human and computer systems, not only as technically but also as artistically with multi-media works. Secondly, I will lecture to design , develop and produce sensing system easily without expert knowledge of electronics. Thirdly, I will lecture of handling sensor information to create interactive art with MAX environment. I will take many sample sensors and many sample MAX patches, so attendants can experience treating sensors, programming the algorithms and composing sample works. Finally, we will discuss the possibility of "new human interface" and the interactivity with multi-media technology. (1) Why developing/using sensors in composition ? At first, I will introduce the movies of my works of interactive multimedia arts using original sensors, as samples of the theme of this workshop. In Japan (you know AKIHABARA ? ), we can use easily the powerful microcomputer board with 32-bits CPU (clock 16MHz), 2 serial (MIDI/RS232C) ports, 8 channel 10-bits A/D, 40-bits or more Digital Ports, 2 channel 10-bits D/A, 5 channel 16-bits counters, 128KB FlashEEPROM, 8KB RAM and more. It costs only $30. I have produced many original MIDI equipments in a part of my composition. We call this "AKI-H8". I have little time to explain about this development , but many musician or artists (not specialists in Electronics or IT) in Japan develop their original MIDI equipments with my Japanese WebPage . There are many sample circuits and sample AKI-H8 source codes and binary codes runnable directly. If you want to study this, please study Japanese at first. A week ago, I developed an universal [analog-to MIDI] interface for this Workshop bringing with myself to Berlin. The whole development period was 2-days (making holes on the case, soldering and wiring, software developing and debugging). Of course, I used 2 AKI-H8 in this box for 16 channels Analog Inputs and 2 channel MIDI outputs (each 6 thru connectors). And I have developed these special [analog sensors] within this development. I also will bring them to Berlin. I will explain how to design these sensors with [analog-to-MIDI] interfaces in media arts. This is very simple and fun !! I distribute some sample patches of MAX at the singuhr hoergalerie in parochial to ALL participants. You can use my bringing sample sensors. And, let's try experiments and discuss about the interactivity in media arts ! This patch is only for my demonstration because the sample sound file is so big. Of course, you can control MSP parameters with sensor information. As you know, SuperCollider can deal with MIDI information directly, so you may treat sensor MIDI message directly with SuperCollider. But myself, I use Max [sensor to music] algorithm at first, and one of the output of [master] Max controls [slave] SuperCollider. This is the SuperCollider program of my work [Bio-Cosmic Storm]. 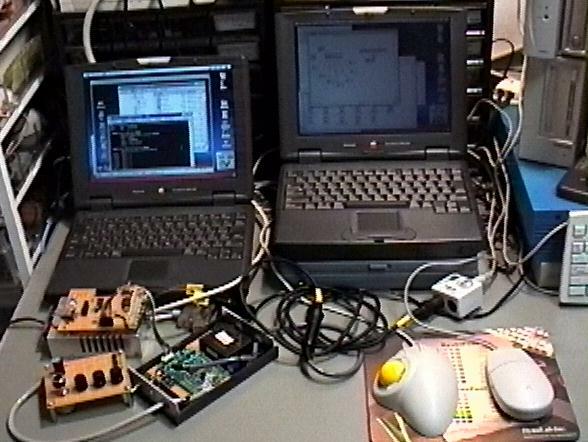 I used 2 PowerBook in this worak, running this program in SuperCollider and running Max patch. 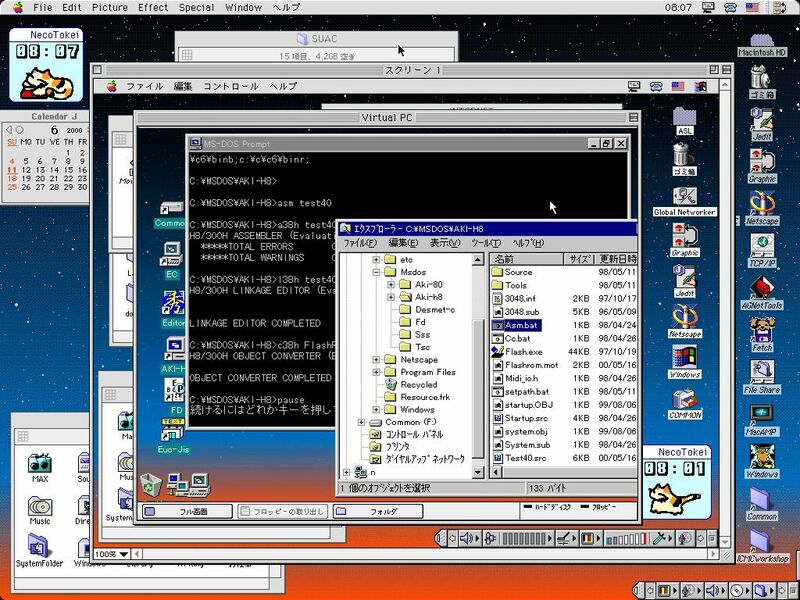 Just like as SuperCollider, I use Kyma as the [slave] component of my work/system with [master] MAX. Above is the output of [SHO breath sensor] produced by myself. I composed a work [Visional Legend] for Tamami Tono Ito (composer, SHO player), and using the same concept for the work.